"Grounds and Buildings of the University of California, Berkeley, Alameda County, California, U. S. A." 15-3/4 x 10-5/8 in. (Matted: 23-1/8 x 17-1/2 in. 17-1/2 x 14-3/8 in. (Matted: 23-1/8 x 17-1/2 in. 13-3/8 x 13-1/4 in. (Matted: 23-1/8 x 17-1/2 in. 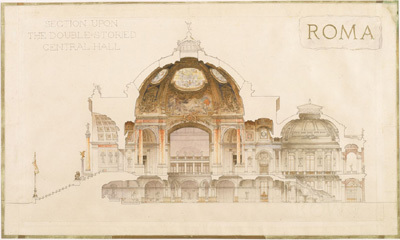 Planting Scheme, West Elevation of California Hall, Boalt Hall, and Philosophy Building n.d.
113 x 66 in. (Framed). 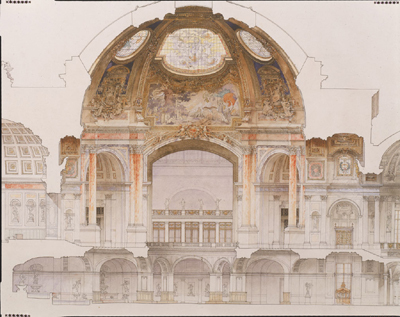 Hearst Memorial Gymnasium for Women, Perspective of North Pool with suggestions for sculpture and color, n.d.